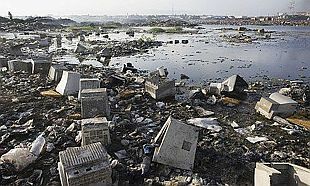 At Computek, we believe that 'Responcible and enviromentally friendly methods for the recycling of old computer equipment should be a prerequisit in any firm or business in the modern computing age. 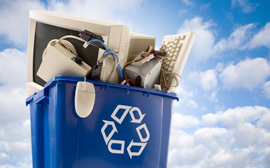 Computek can arrange collection, removal of old systems for safe environmental recycling. The process also includes 'Data Destruction to ensure that any sensitive information is safely and securely erased. The above picture shows one of the distasteful sides of the computing age. What happens with old end of life computing systems as we move forward and upgrade to newer more reliable faster systems. At Computek, we handle all recycling 'In House' , breaking down the old units into the re-usable components and ensuring that the end waste products such as metal/plastic casing are processed by reputable companies and preferably where possible by companies within Ireland. 1Upon arrival a unit is assesed as to whether it can be re-furbished for the second hand market. If the unit cannot be refurbished then it is stripped to component level and the parts can then be placed into either storage for use as a parts base or resold as servicible second hand parts..
2Hard Drives would not be included in this process and are dealt with seperately and securely. At Computek we take 'Data Security' very seriously and upon ensuring that any client is satisfied that they have all of there data securely backed up and safe, we will use specialist industry standard software to completly erase the hard drive ensuring that data retrieval of any kind is impossible by any of the standard known methods. Recycling of equipment, be it medium or large business can be a time consuming process. Finding the right method of disposal, ensuring any sensitive data is securely erased prior to disposal, this includes hard drives fitted to high end laser printers! At Computek, we take over the hard work for you. Putting in place a complete solution to meet your requirements. Upon first contact we will discuss briefly what you require. The amount of equipment you need to recycle and the secure erasement of data. Next we arrange an 'on site' visit to look over your installation and to plan the extraction of your old system/s for recycling with the minimal disruption to your ongoing service. Once everything is agreed then we will implement the agreed strategy and commence operations. A typical medium office environment can be completly removed in as little as 3 hours.